FEATURING Short, fully licensed film clips from popular movies with thought-provoking guides. Unlimited access to thousands of titles for dollars a day! For the last 40 years, Criterion Pictures has been providing feature film rights to the Post Secondary market. We are well versed in the title selection for this market sector and we're easily able to extract a list from our database, based on actual bookings. Criterion Pictures has developed an on-line digital delivery feature film platform called Criterion-on-Demand. Our goal is to provide easy access to educationally relevant feature films used in Canadian Higher Education Institutions. 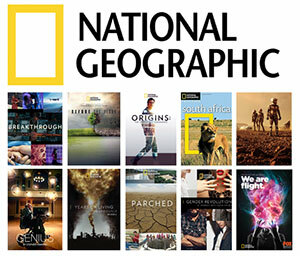 National Geographic titles that will enlighten and motivate your students! More than 29,000 programs ranging from educational, documentary programs to inspiring, thought-provoking TV content. French & Sp anish language versions are available for most titles!